Looking for fun Christmas ornament crafts for kids? 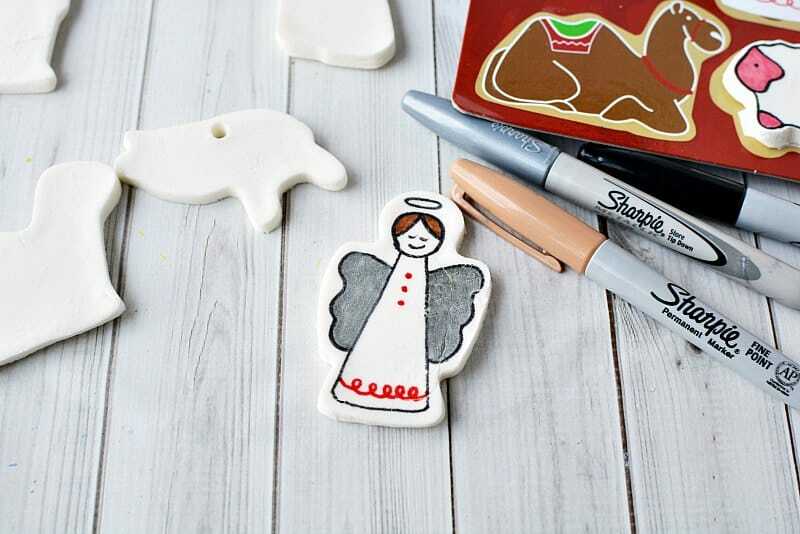 Check out these DIY nativity ornaments to make with baking soda dough, cookie cutters, and markers. Making homemade Christmas ornaments with my kids is one of my favorite holiday traditions. Every year we do a little craft and make a batch of ornaments together. 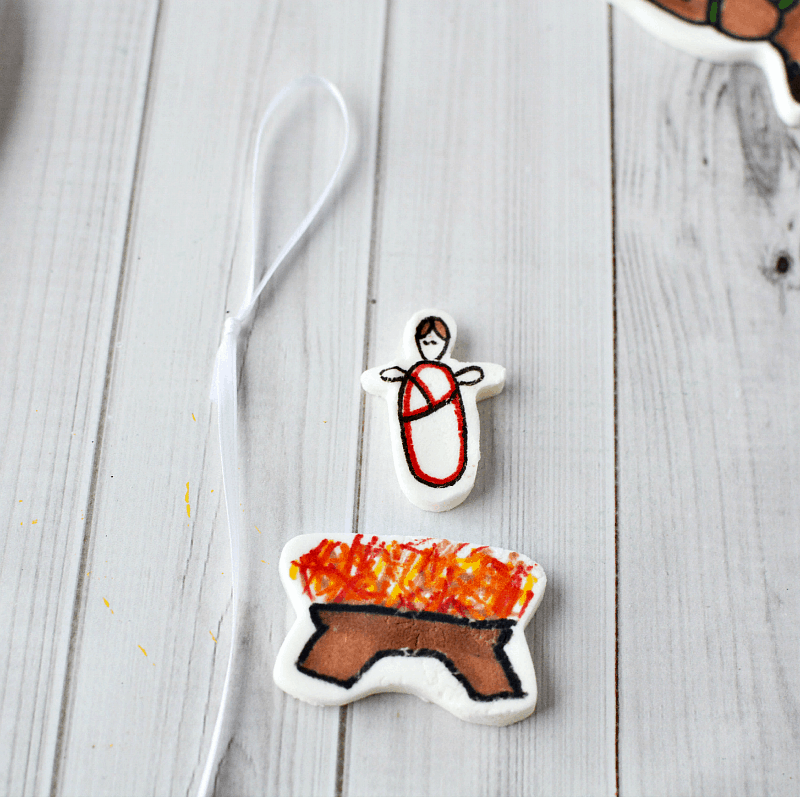 Last year we used air dry clay to make No Bake Clay Christmas Ornaments Scented with Essential Oils. We've also been crafting with wine corks this winter with DIY Wine Cork Snowman Christmas Tree Ornaments and Angel Wine Cork Ornaments. A few years ago we tried out a baking soda dough to make “salt” dough ornaments. I fell in love with this dough for ornament making. It's such a nice white dough and it's easy to work with. 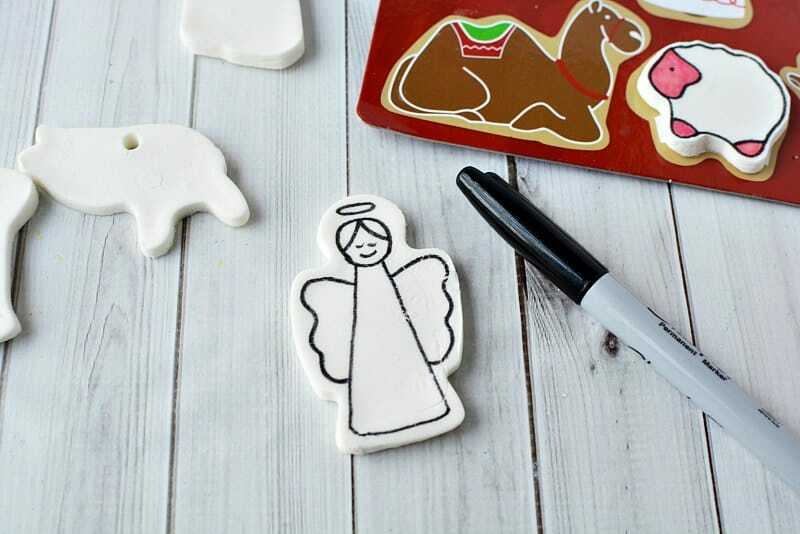 We tried something different this time use the dough with a nativity cookie cutter set and use markers instead of paint for detailing. We think they turned out super cute! Make a batch of baking soda dough. Roll the dough out. The smoother the dough the better. If there are wrinkles, they will remain and may show a bit in the final piece. 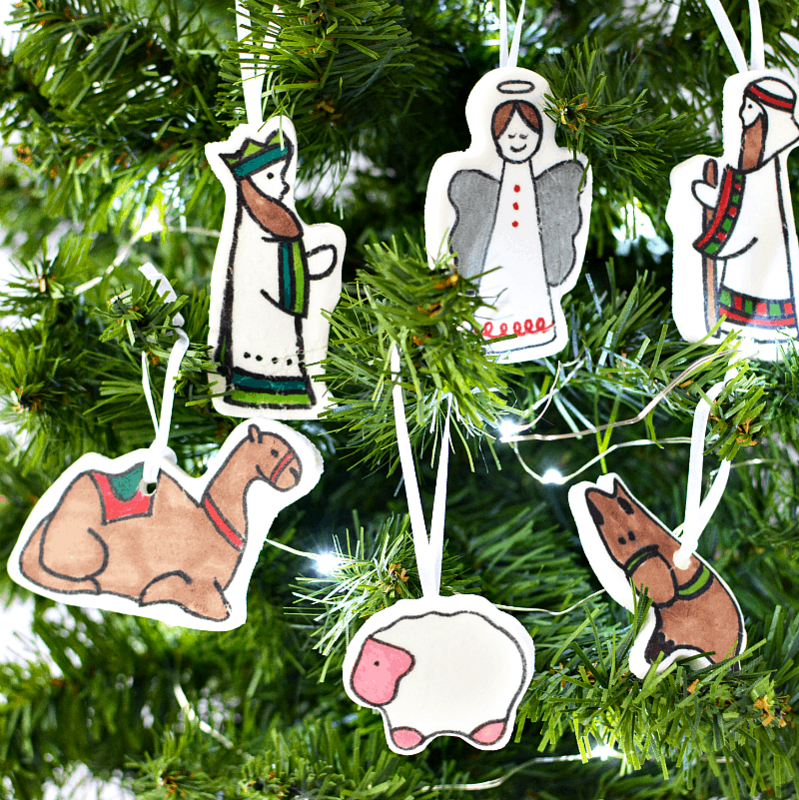 Cut out 1 of each shape of the nativity cookie cutters available online. You will need to decide whether or not to put holes into the heads of all of the ornaments. We only put holes in certain ornaments because otherwise the hole would cut into the head of the ornament. We did cut a few holes and also glued some hanging ribbons on the back as shown below. Use a straw to make the holes, if desired. Bake the ornaments. Then allow to dry in the oven and let set overnight on cooling racks. All of the instructions for making and baking the ornaments can be found in our Homemade Clay Christmas Ornaments: Star Wars Style post! 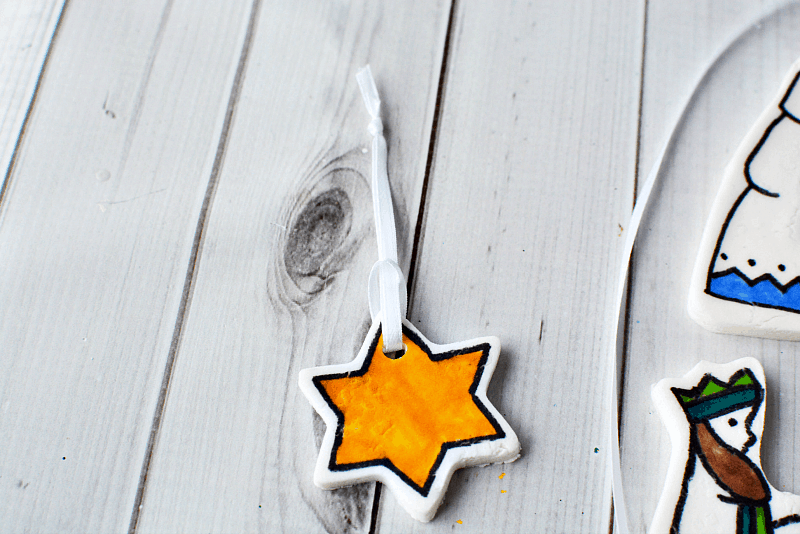 Once your ornaments are completely dry, it's time to decorate! 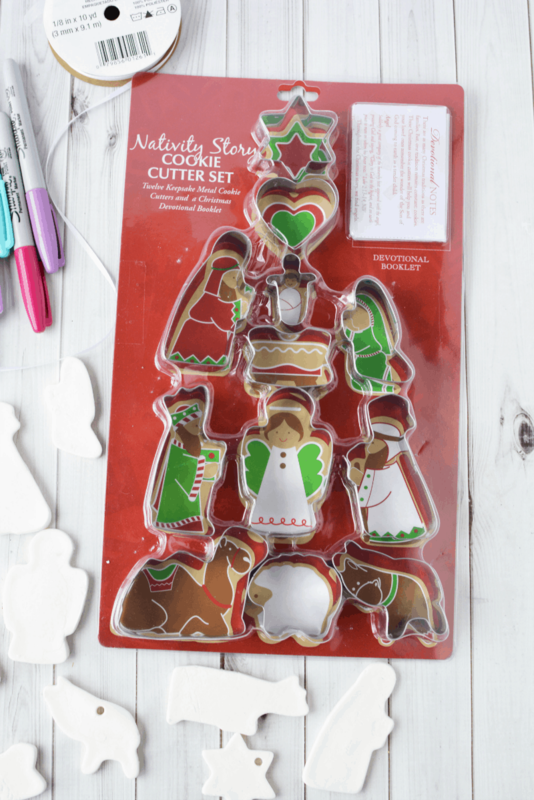 Begin by using the cookie cutter packaging as guide in drawing the lines onto the front of the ornament. 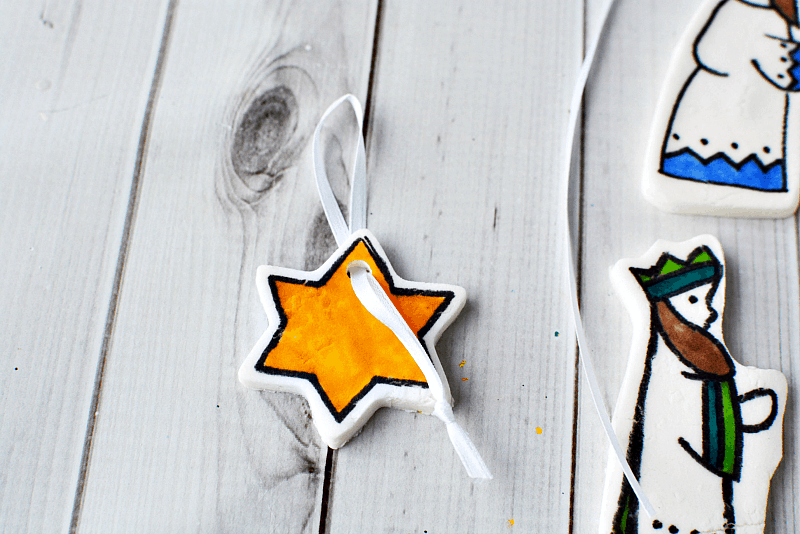 For the majority of the ornaments, start with the black outline and then add color. You could draw the outlines very lightly with pencil and cover with a permanent marker if you are worried about making a mistake. The lighter/brighter sharpies worked better for this project because the dough really soaks up the marker pigment and made the dark colors quite dark. 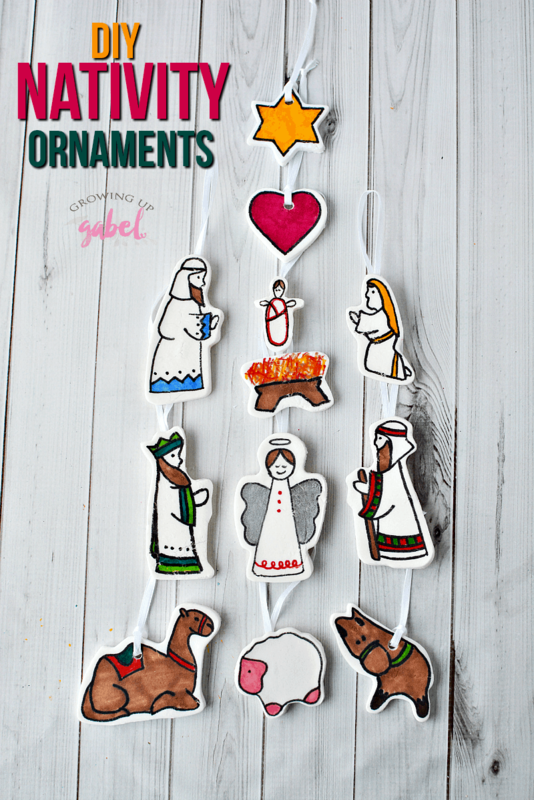 If necessary, you can test the marker color on the back of the ornaments, or cut a scrap piece to do this. Once your ornaments are decorated, add a ribbon to hang them. Cut about an 8″ piece of ribbon and tie the ends in a knot. Slide the looped end through the hole and bring the knot through the loop creating a slip knot. Pull tightly and hang onto the tree. 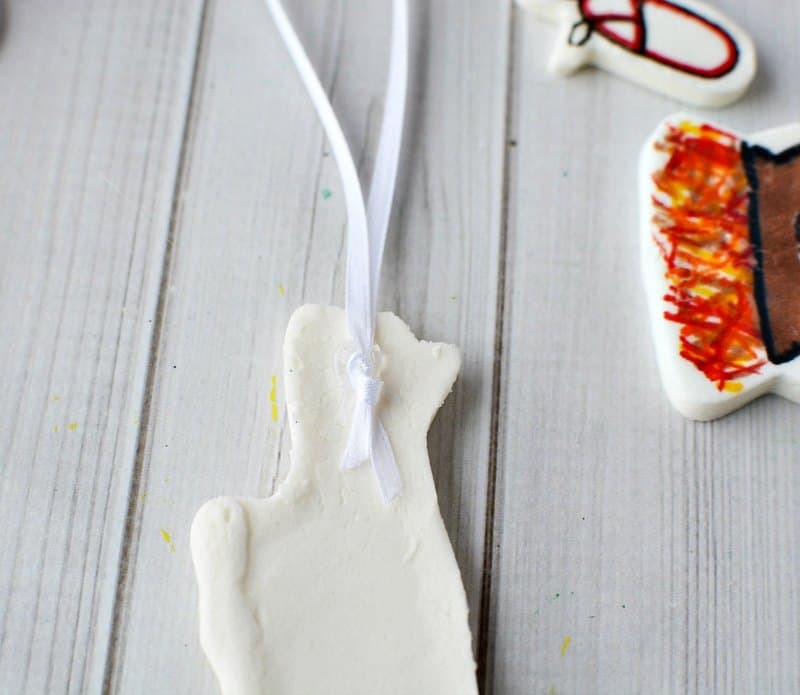 For ornaments without a hole, tie a knot in the ribbon and attach it to the back of the ornaments with hot glue. Let set to harden. In this set, baby Jesus and his manger are two separate pieces. 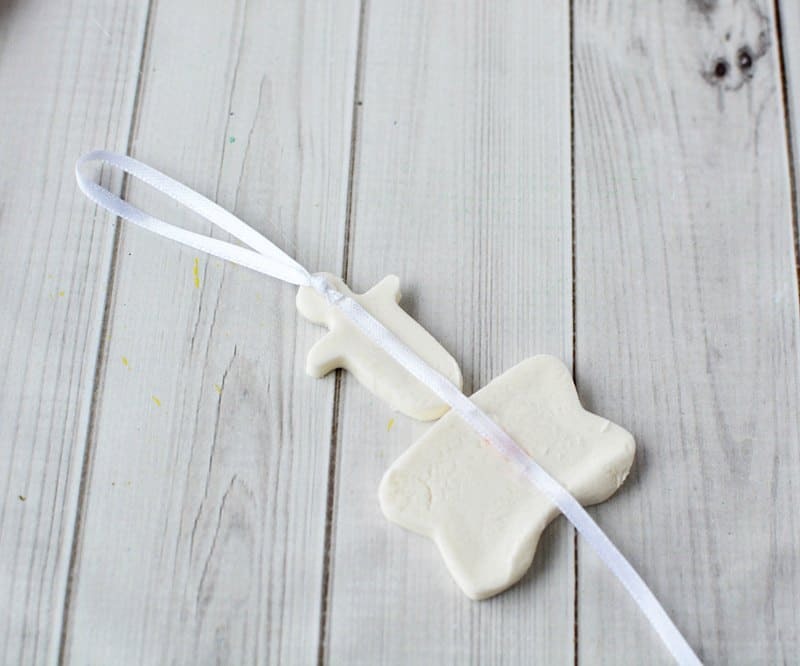 To hang them together cut a piece of ribbon about 12″ in length. Tie one end about 3″ in length and knot. Place the baby and crib face down. Affix the ribbon to the back of the baby and crib as shown with hot glue. Let set to harden. Trim excess ribbon. 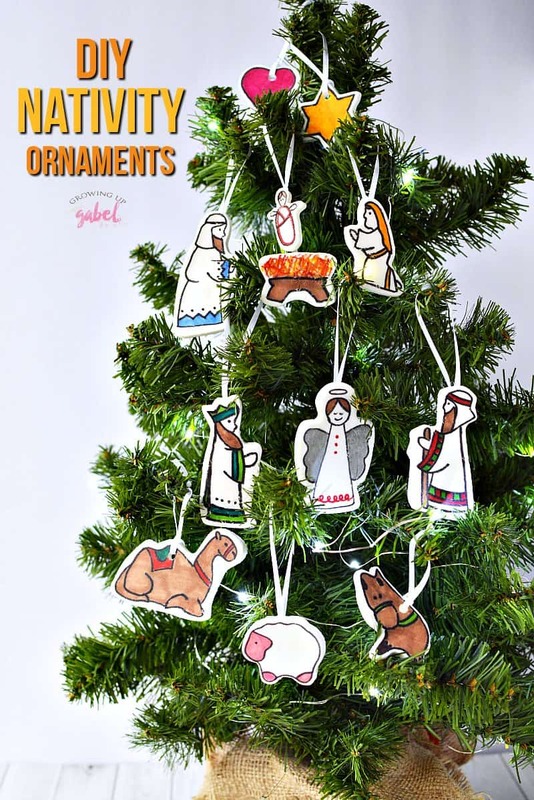 The ornament set is the shape of a tree, as they are displayed in the package. 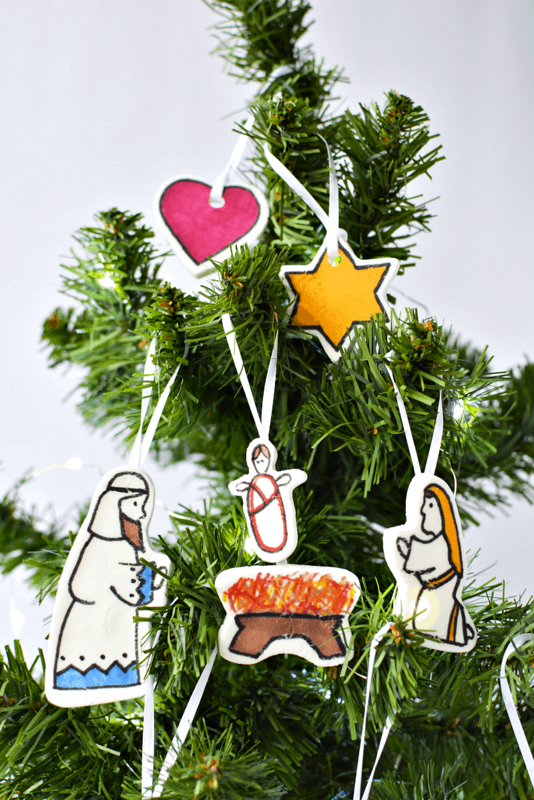 So you can hang these on a tree randomly, or try to keep their “shape” and start with the star and work your way down and out the tree branches. There are 12 separate pieces to this nativity. It'd be fun to use it as a lesson or activity to make with kids during the 12 days of Christmas from December 25 until January 5th. Yes, that's after Christmas. But those days are usually much slower and less chaotic! It's a great time to spend time as family celebrating the season. 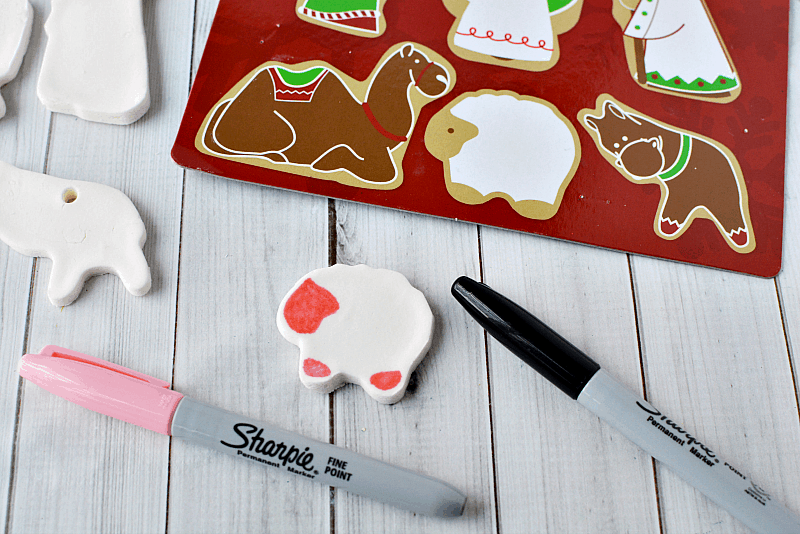 DIY nativity ornaments to make with baking soda dough, cookie cutters, and markers. 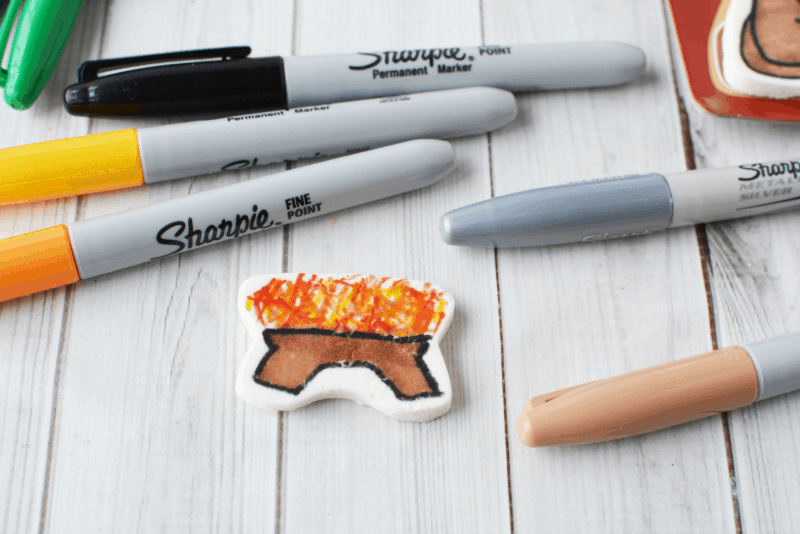 Bake the ornaments. Then allow to dry in the oven and let set overnight on cooling racks. Decorate the ornaments. 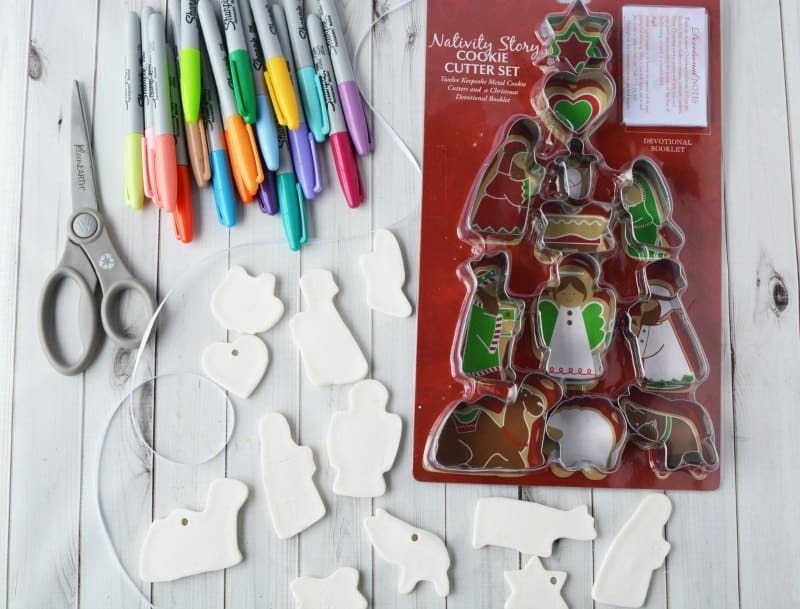 Begin by using the cookie cutter packaging as guide in drawing the lines onto the front of the ornament. Once your ornaments are decorated, add a ribbon to hang them. Cut about an 8″ piece of ribbon and tie the ends in a knot. Slide the looped end through the hole and bring the knot through the loop creating a slip knot. Pull tightly and hang onto the tree. Love this post! Here all this craft are lovely. I want to make these craft at my house for my kids. Thanks for sharing! Sooo cute! Happily sharing via Tailwind for you to my Crafts to Make and Faith boards. Hope you have a lovely Christmas with your family.